Magnolias are a traditional sign that spring has arrived each and every year. 'Lucky Red’ produces giant flowerheads that house over 40 tepals to create the most spectacular blooms. 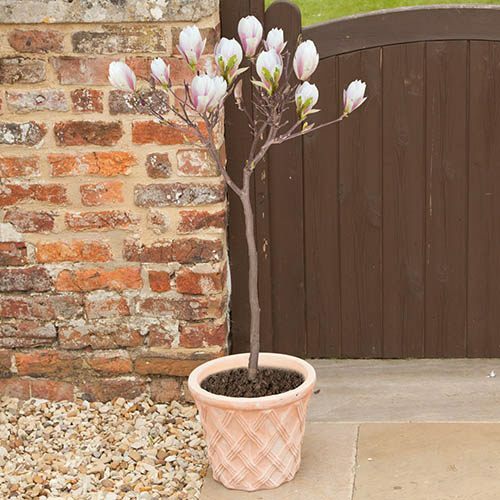 Here it has been grafted into a half standard form for the perfect garden or patio feature. Hardy to -15C and with just a little prune to shape will form a nice, low maintenance, medium sized specimen garden tree. Supplied bare rooted , grafted into a standard form, approx. 70-80cm tall, ready to plant out. Magnolias are a traditional sign that spring has arrived each and every year, with their beautiful huge buds bursting into colour early in the season. This special variety ‘Lucky Red’ will really wow with its large flowerheads that house over 40 tepals to create the most spectacular blooms! As well as its dramatic flowers, here ‘Lucky Red' has been grafted into a half standard form to create a lollipop-effect with a ball of foliage and flower atop a long clear stem – turning a traditional tree into a contemporary feature for any garden. Easy to grow, it’s already been grafted into a half standard form, hardy to -15C (although best to avoid windy sites) and with just a little prune to shape will form a nice, low maintenance, medium sized specimen garden tree. Plant up in a large patio container and place by a doorway, gateway or pathway where it will make a superb eye-catching feature, or on a patio where you can really enjoy the beauty. Supplied as a bare root tree approx. 70-80cm tall, ready to plant.